Posted on Sep 28, 2015 by Appleton Downtown Inc.
You have probably heard of the Fox Valley Symphony, the Sweet Adelines or the Attic Theatre but never attended a performance. Perhaps it was your unfamiliarity with the venue or the cost that held you back from attending. Now there is a way to help you discover and enjoy many of the arts and cultural venues available in the Fox Valley. While visiting friends in Phoenix last February, I was introduced to a unique approach to help introduce the arts to people who perhaps are not currently enjoying them. The program is called Act One and is a collaborative effort between the local arts and cultural nonprofits along with the Phoenix library system where free tickets or passes to events and attractions are available just by showing a library card. The program has been successful for a number of years and I thought that we could duplicate it in the Fox Cities. The idea is to have individual venues make available free passes or admission to their events to encourage people to experience art and cultural events that they many not otherwise attend. Passes would be available at the library on a limited basis and could be “checked out” with a library card. It is almost just that simple, but obviously we needed the support of the local art and cultural community. The concept was presented to the members of the Fox Arts Network, a collaborative group of non-profit arts organizations dedicated to encouraging citizens to discover and explore the local arts community. Appleton Downtown Inc’s Attractions Council and the Appleton Public Library were also brought into the discussion and the idea was unanimously endorsed and given a go-ahead. The library has provided the space, logistics and their wonderful staff to this program. The program, called the Art FAN Pass, will offer admissions and entrance to over 18 arts and cultural organizations and event venues at no cost and will begin this month. 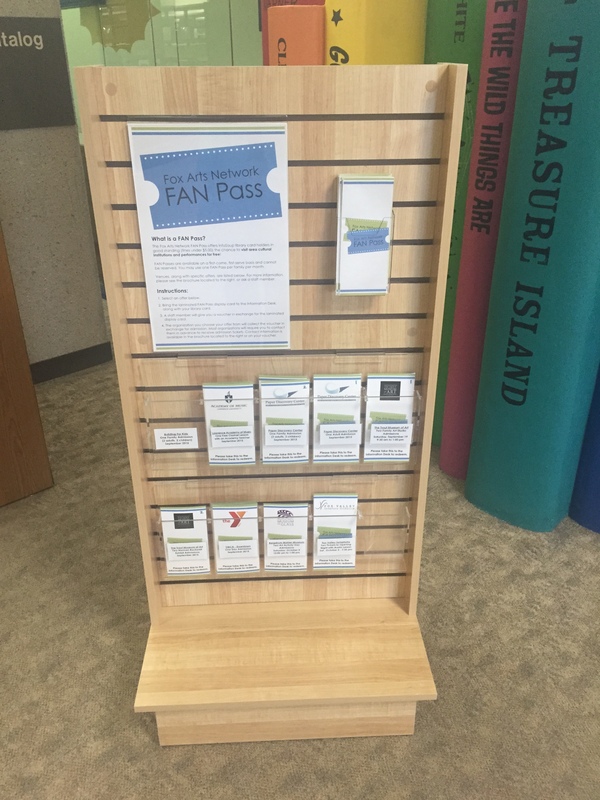 The Appleton Public Library will host the information and passes, which will be available to Appleton Public Library card holders. Passes and admissions will differ by venue and the specifics for each will be clearly displayed at the library. There are limited passes available and are designed to encourage first-time visitors and families to discover venues and organizations that they have not previously enjoyed. From concerts to exhibits to performing arts, the arts will be open to a whole new audience. This program is a first step in opening the arts and culture of the Fox Cities to those who may not otherwise have either the option or the inclination to experience them. We hope that it will prove successful and prove to be a model that neighboring cities and libraries will duplicate. Without the support and expertise of the Appleton Public Library, the donations from Fox Arts Network and Downtown Attractions Council and the encouragement from Appleton Downtown In., this fantastic opportunity would not have happened. — Mary Ann Wepfer is the director of the Fox Arts Network. 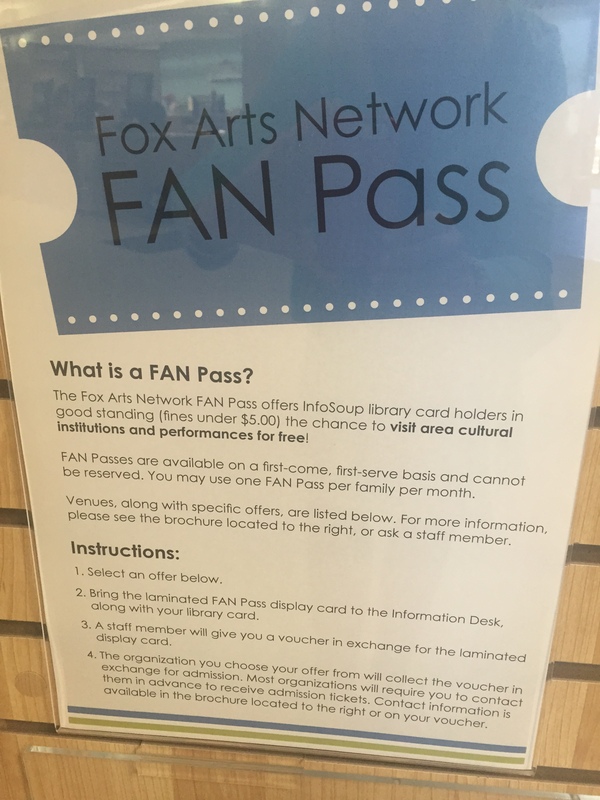 FAN is a grassroots arts organization made up of nonprofit arts groups serving the Fox Cities and surrounding communities with a goal of encouraging trial in all art forms. Email foxartsnetwork@gmail.com. Great article titled Music can be a soothing tonic for anxiety..... By Jill Morgan. Thank you, let's have more ways the Arts can be a positive, engaging part of our lives and community.